Through the coordination efforts of Tina Rahui and Bronwyn Pogson, funds are being raised to support the team’s attendance at the Chess Nationals in Auckland during the first weekend of the coming holidays. A major fundraiser was held last Sunday at the Daffodil Festival. 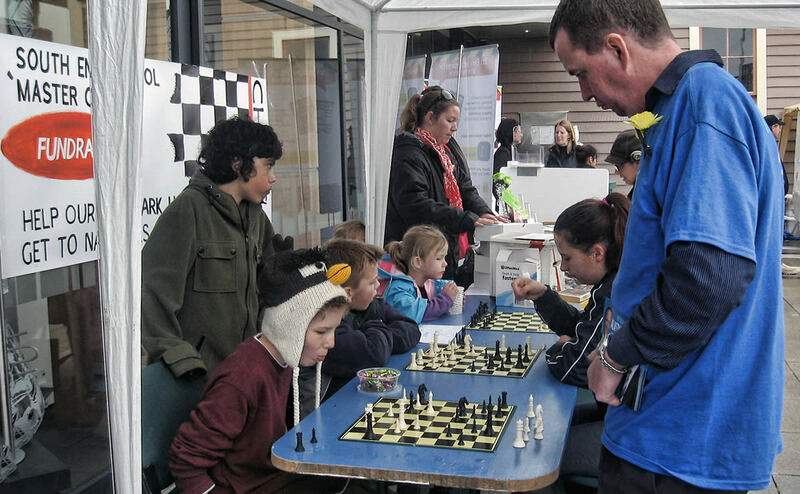 We had a booth just outside the Carterton Events Centre and people had opportunities to play chess against members of our team. We also sold baking which had been donated by many parents, and a raffle for a fantastic cake with a chess board theme! The fundraising was a great success and will go a long way towards covering the costs of four students and an adult getting to the Auckland tournament. A big thank you to our Parent Support Group and everyone else for your support of our chess team! Fundraising outside the Carterton Events Centre!